I've been writing about how different music formats and technologies have shaped the way I organised 'playlists' during my lifetime of music consumption. Nowadays, iTunes and Last FM count up and track everything I play, and tell me what my 'most listened to' artists and songs are - but what about the records I listened to when I was young? My dad got a new "music centre" towards the end of the 70s - a Sharp model with integrated record deck, cassette deck and radio. 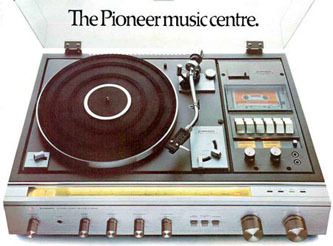 I've not been able to track down a picture of it, but it was somewhat similar to this Pioneer model. I was given his old record player, complete with auto-changer, a bump on the platter guaranteed to warp records, and the ability to play records at 16rpm and 78rpm. Both sets of equipment were still based in our family living room, with separate sets of speakers, but 'my' deck was the one within the reach of a budding under-10 DJ. My parents happily let me play records from their 7" single collection. Although I don't recall it expressly being forbidden, I rarely ventured into playing any of their albums. I think there was something implicit in the form that kept me away. Singles were quick to play, and came in flimsy paper sleeves. Albums came in 'proper' cardboard sleeves. Albums also took much longer to listen to, which must have tested the patience of my 8 year-old DJ self, although I do remember playing Holst's "Planet Suite" and Tchaikovsky's "1812 Overture"". Perhaps most importantly though, my parents still played albums, and bought each other albums at Christmas and birthdays. They were clearly a 'grown-up' form of music. However, this meant that whilst my contemporaries where growing up on a diet of "Seasons in the Sun", "Grease", the Bay City Rollers and the emergence of disco, I was listening to singles from The Rolling Stones, Creedence Clearwater Revival, Buddy Holly, Eddie Cochran and Elvis, which has gone on to influence my adult taste in music. I've no doubt that my long-standing love of records with close harmony vocals, for example, comes from hours spent listening to The Hollies and The Everly Brothers as a child. My interest in what I would now call the metadata around music began at an early age as well, as I can remember organising my 'playlists' by label. 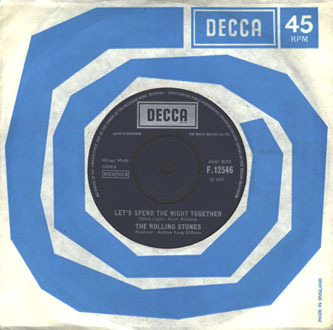 I tended to associate the 45rpm label designs directly with the bands and artists who recorded on them. Forever, for me, the blue Liberty label cries out Creedence Clearwater Revival, and a seventies orange RCA label means only one thing - The King. In fact, as a child, I was a little confused when artists changed labels. I didn't really understand why, for example, the later Rolling Stones single "Angie" came with a yellow label, when the rest of the Rolling Stones singles my parents owned were on the classic blue Decca label. The record deck I used had an auto-changing mechanism. When the tone-arm reached a certain angle away from its resting position, which indicated it was most likely on the run-out groove of a record, the mechanism kicked in. The arm lifted, and was removed from the playing area. 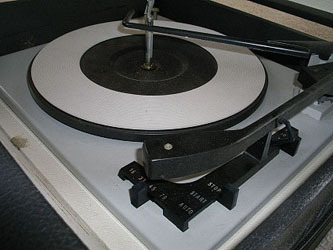 Then, a mechanical movement allowed the next stacked record to drop to the platter, the tone-arm returned, and descended on the edge of the record. Again, I can't find an exact picture of my old record deck, but the auto-changer mechanism was similar to the one on this Bush model. The iPod has made the 'playlist' something everyone understands, and is something put together by a few spins and clicks of the control wheel. When I was young, and using this old 70's analogue vinyl system however, a 'playlist' was a sequence of up to six records that you could stack on the auto-changing mechanism. I honed my DJ skills as a youngster by sitting for hours after school doing made-up chart countdowns to myself, performing the Smashie'n'Niceie-style DJ patter linking tracks, whilst the needle lifted from the vinyl that had just played, the auto-changer did its magic, and the next record descended. There was a physical restriction here as well. You couldn't listen to both the 'A' and 'B' side of the same record within the same batch of six. Although as a youngster I understood that the 'A' side was more important and mostly better than the 'B' side, I often must have played both sides of a record roughly about the same amount of times. 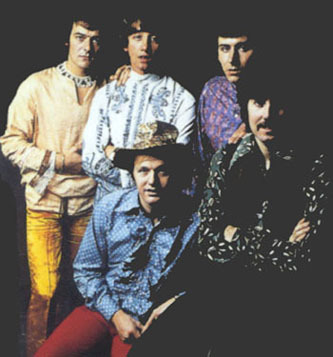 Thus I am just as familiar with a Terry Sylvester led Hollies track like "No More Riders" as I am with the slightly more famous #2 hit "The Air That I Breathe" that graced the other side. Although not frequently listened to, many of the artists from these formative musical experiences still have a presence on my iPod, including The Hollies, Rolling Stones, Everly Brothers and Creedence Clearwater Revival. Record label branded paper centres with artist, title, label, composer and year published details. Sometimes generic record label outer sleeve. Stacking 6 records at a time on an auto-changing mechanism. The Hollies, Rolling Stones, Elvis, Cliff Richard, The Everly Brothers, Buddy Holly, Eddie Cochran, Creedence Clearwater Revival. In the next part of this series I will be looking at how I moved on from just being able to play my parent's records, thanks to my own cassettes and radio/cassette recorder. By Martin Belam on 15 July 2008.